Hey Matt, how are you doing? The last time that we spoke was in London almost 18 months ago – it seems like an age a go! Yeah definitely – that was a whirlwind of a trip for us! I think we were laying our heads down on the table when we met! Your second album Happy Endings comes out on Friday. How excited are you for the album to drop? It feels great man! It feels like we’ve been waiting on it for a long time so to actually be here in this moment is pretty great. We’re excited! You’ve released 5 songs already. How has the reaction been to those? Yeah the reaction has been great. It’s a little nerve wracking to release your second album but the way that we’ve been doing it has kind of given us the confidence because of the reactions that we’ve had from everybody. I guess the second album is always the difficult one classically! I know you’ve been doing a lot of the songs on the road so I guess that you’ve been able to gauge how people feel towards them? Yeah we’ve been playing some of these songs for like a year on the road and then some of them we’re just now starting to integrate into the set so, yeah, we feel great! As you’re all great songwriters in your own right did it make it difficult to pick the songs for the record and was everyone bringing a lot to the table? No it actually helps. I think because we’re all songwriters and have that mindset it definitely helps to look at the songs and figure out which we think are the strongest. A lot of people, a lot of other artists, the biggest problem that they have is finding the right song and for us being songwriters our problem is too many songs. It’s a great problem to have and we can kind of whittle it down to the best ones. We’ve had a listen to the full album already and love I – it feels like it picks up from where Meat and Candy left off in the right way. Do you personally feel that? Yeah definitely. We didn’t try to think to hard about it. We kind of did what we did before and just made music that we liked. It’s gonna sound like us because it is us and we have a chemistry as a band, you know, there’s five of us that bring something to the table so that’s what is going to make the Old Dominion sound we don’t really have to think about that – it is what it is. We’ve grown a lot as writers and musicians so I think that kind of just shines through naturally in what we do. Would you say the band has changed much since the first record in how you want to sound? It’s the natural progression of it. Since Meat and Candy came out we’ve probably played 500 shows so you definitely grow as a band when you play that much and you’re on the road that much, you play that much and you’re writing that much. You definitely go through changes and again we don’t think about what kind of changes we want to happen they just happen or we get inspired by different things and that comes out in our music. Yeah and some of those songs on the spot right there in the studio you think “ah maybe this isn’t the best way to do this song” then you change it a little bit and suddenly it brings a whole new life to it. Shane McAnally was back on production duties for Happy Endings. Judging from social media you all enjoy a great relationship. How much does he bring to the table for the album? A lot! He’s a great friend of ours and we were friends with Shane, you know, before any of us had any success including him – we were all just broke songwriters! We were great friends and still are. His mind works different than anyone else I’ve ever met so when he’s in the studio often he’s the first one to recognise if something is or isn’t working and he says “do that” or “don’t do that!” so he’s a great outside perspective. He’s able to look at what we’re doing and bring out the best pieces and edit out the worst. I guess when you look at the work that he’s done with the likes of Brandy Clark and Kacey Musgraves he’s someone who’s not afraid to do something that might be a little risky. For a song like ‘Be With Me’ that has quite an empowering message for women which is kind of a tough subject in country music at the moment. Someone like Shane is so brave in doing whatever he feels; was he a big help in doing that and giving you the confidence? Yeah he definitely gives you the confidence to say whatever you want to say and I think as songwriters, him included, we have all gotten to a point where we realise we need to stop chasing what we think we should say or what people want to hear and we just need to write what’s important to us and what moves us. He’s definitely encouraging in that way. Do you have an early favourite from the record? That’s so hard to pick! Obviously ‘No Such Thing As A Broken Heart’ is really really fun right now because it’s so amazing to see a song from it’s creation all the way through the recording process and all the way onto the radio and all the up the charts. It’s an unbelievable thing to witness so that one is really fun to play right now. But, you know, I love playing ‘Written In The Sand’ and it gets quite a reaction whenever we play it. It’s really hard to pick a favourite! It’s clearly been a busy few years since the release of your first record with a lot of touring. Do you ever get chance to sit back and enjoy it or is it just a whirlwind? It’s a little of both. I think we’re getting better at sitting back a little bit and finding those moments and when they hit allowing ourselves to take it in. Quite often that happens onstage when there’s a big crowd of people and they’re all singing and having a great time so I think that’s when it happens the most. You just kind of sit there for a moment and take in that crowd and that energy that they are creating and it’s in response to our music. We definitely try really hard to take that in. What have been the real standout moments for you in the last couple of years? I mean, I feel like those moments are continually happening! It could be little things like looking at the size of the organisation that we’ve built and our crew and how amazing they are and how hard they work for us. Now we have this network of people who depend on us so little things like that. Playing CMA Fest in the stadium show… it’s just crazy! It’s moment after moment! 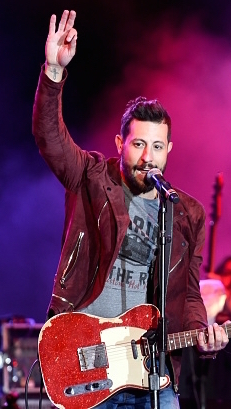 You seem to have a great connection with your fans that is unlike many other artists – just looking at the Old Dominion Fans Instagram you guys are constantly posting and replying to them. Do you think that has helped with your success? I think so. I think we really appreciate that we wouldn’t be here without them. We owe it all to them. That’s why we write and play music. Music in some shape or form has changed our lives when we were younger and just fans and it made us want to do that for other people so they’re allowing us to do that and they’re changing our lives. I think that the connection between us and them is only going to grow! Let’s talk a bit about the UK and Europe. You were over here 18 months a go for Country 2 Country as well as your own headline show in London. How did you find that experience? It was surprising! We didn’t know what to expect when we were there – we kind of expected nobody to know who we were! The response that we got was definitely surprising and encouraging and makes us excited to come back. I remember speaking to you just before the show and you said it was really an unknown to you and you just hoped the crowd would want to listen. Did it exceed those expectations? Definitely! People, not only did they listen, they knew the songs, which was a bigger surprise! We expected to kind of have to come over and prove ourselves a little more than we had to. Did you ever really expect to have such a strong following singing along to every word at your first UK shows just weeks after Meat and Candy dropped? Yeah, you talk about those moments where you’re like “woah! What’s happening!” and that was definitely one. We fly across the ocean and people know our music which was definitely not something that had entered our brain at that point! You head back over here in November to travel around our lovely country a little more in support of Thomas Rhett. How excited are you for that? Yeah it’s going to be great. It was such a fast trip last time and we didn’t really feel like we got a chance to take it in so this feels like it’ll essentially be our first time to take a breath and look at it all and experience it for what it is. Interestingly a lot of acts are now touring in support of other artists in the UK who’ve already broken ground. For instance Brothers Osborne support The Cadillac Three this year and Drake White supports Kip Moore. Is it a safer way to start building that following over here? Yeah definitely for us that’s what we want to do. That’s how we built our following over here in the States by just touring as much as we could and when we found an act that would take us out we would go. It seems like Thomas Rhett has got a bigger following and it’s something that we can pair together. It’s going to be a great tour – that combination is one of the best that I can imagine! Are you very aware of the fan base that you’re building over here? We’re doing a competition to win a copy of the record and the response has been massive! No we are completely unaware! I think it’ll be a surprise again what we are going into. Like I say the first trip was so fast. We were in and out and it was like “woah! They kind of knew us there that was crazy!” It’ll be really interesting to see, we’ve done a few interviews like this one where people say “you’re coming into something big here” so we’re excited! We’ll be at the Manchester show so hopefully there’ll be a chance to catch up there and have a beer again! 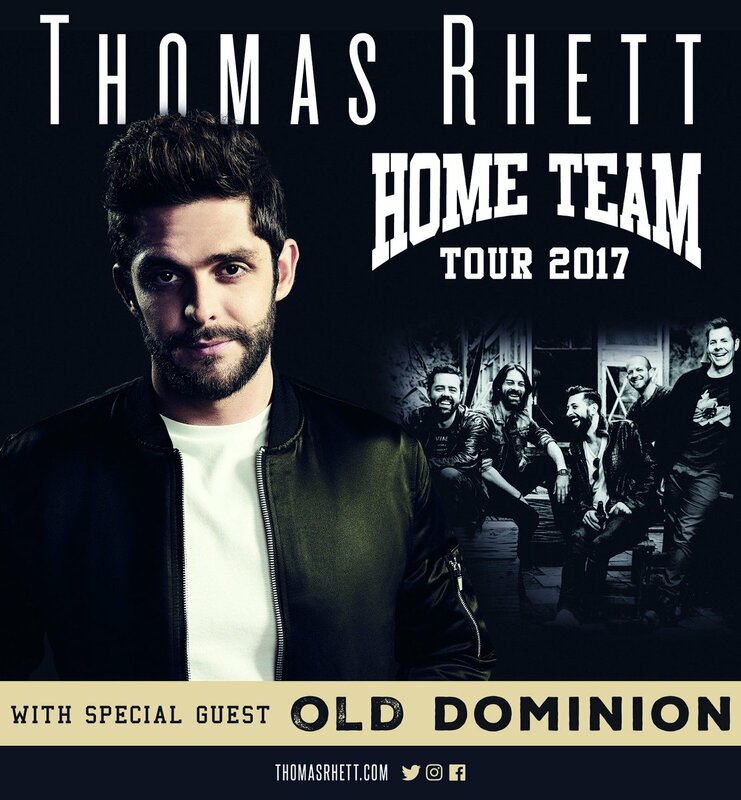 Old Dominion hit the road in support of Thomas Rhett in the UK in November. More information here.